Firma Melodiya presents recordings of piano compositions by Edvard Grieg. Lyric Pieces is a genre which accompanied the Norwegian composer along nearly his entire creative path. Ten books, composed between 1870 and 1900, are a sort of creative diary for the composer and they recorded his impressions, genre sketches and deep emotional experience. What we find here are dance pieces, landscapes of northern nature, fantastic images and lyrical reflection. 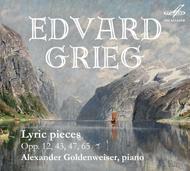 Four books of Grieg�s Lyric Pieces are performed here by Alexander Goldenweiser. A brilliant pianist, professor of the Moscow Conservatory where he taught for over fifty years, and editor of piano literature, he is rightfully considered one of the founders of the Russian piano school of the 20th century. A pupil of Alexander Siloti, who in his turn studied under Franz Liszt and Sergey Taneyev, one of Tchaikovsky�s students, he was closely acquainted with Leo Tolstoy, Sergey Rachmaninov, Alexander Scriabin and Nikolai Metner. Goldeweiser�s performance combined the achievements of Russian and European romantic pianism with novelty piano art of the 20th century. Goldeweiser�s style was characteristic for its filigree, lyrical spirituality and utmost loyalty to an author�s text. Two pieces played by the composer himself (Butterfly and Little Bird - numbers 1 and 4 from Book 4) are a bonus.